Founded in 1982 by Morten Harket, Paul Waaktaar-Savoy and Magne Furuholmen, a-ha (spelled only in lower-case) is Norway’s best selling, Grammy nominated new wave band that has internationally sold over 40 million albums, won a phenomenal number of critical and popular awards and the first (and perhaps the only) Norwegian band to hit the No.1 spot in the U.S. charts. Yet, a-ha is often misconstrued as an one-hit wonder for “Take On Me”, the extraordinary billboard no.1 hit of 1985 which alone is estimated to have sold over 10 million copies globally and the equally popular hit video that won 6 MTV Video Awards in 1986 including the Viewer's Choice award, Best New Artist, Best Direction, Best Special Effects and Best Concept Video (as it featured the rotoscoping technique for the first time). With over 9 hit studio albums, beginning from their 1985 debut ‘Hunting High and Low’ to ‘Foot of the Mountain’ which was released in June 2009, a-ha are one of few remaining pop/rock bands from the 80’s that have transcended their original days of glory and have continued to be successful to this day. In fact, after they announced a formal split in Oct 2009, tickets for their Dec 2010 farewell show at Oslo were sold out in less than 2 hours. a-ha also incidentally hold a Guinness World Record for paying audiences as their January 1991 show at the Rio festival in Brazil attracted a paid audience of over 198,000 fans – the largest in the world for a single act ! I was first introduced to a-ha in 1989 when a friend of mine loaned me a tape of their ‘Stay On These Roads’ album which also featured the title theme song of “The Living Daylights” - the James Bond film. Since then, I have bought all their albums, been hooked by their infectious Nordic blend of breezy synthpop, Morten Harket’s moody vocals and amazing lyrics. As a fan tribute, I have compiled a special handpicked 2 hours+ compilation of their greatest hits from 1985 to 2009, cult favorites like “Take On Me”, "The Sun Always Shines on T.V. ", "Summer Moved On," and some personal selections like “I Wish I Cared” for you to download and enjoy. I am confident you’ll love this unique a-ha music assemblage. THIS IS A NON-COMMERCIAL FAN MIXTAPE. IF YOU LIKE A-HA, PLEASE BUY ORIGINAL AHA MUSIC! 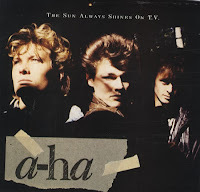 a-ha Music available on a-ha.com, Amazon.com, iTunes.com and your nearest music retailer.